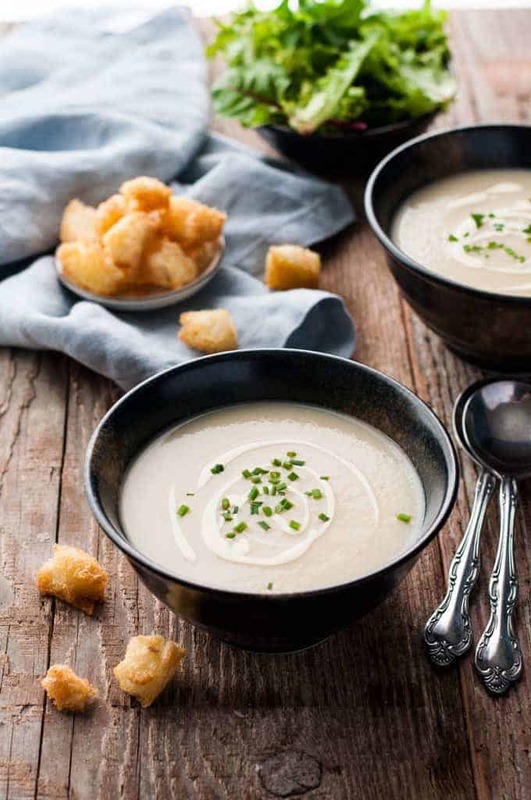 This Potato and Leek Soup is based on a recipe by the great Julia Child from her iconic cookbook Mastering the Art of French Cooking, Volume 1. I say “based” because….oh gee, I hope she doesn’t turn in her grave….but I actually felt that it needed a bit more flavour! The main difference is that the original recipe from her book is made with water instead of chicken broth / broth. It may well be that leeks and potatoes in France are super powered with flavour and broth is not required. Or it may be that generally, people’s palates have evolved in the 50 years since it was first published. Now I must admit, I made a couple of wee other changes as well….sorry Julia, I couldn’t resist! I love my readers tampering with my recipes, and I hope she feels the same too. 🙂 I personally believe that cooking is all about adapting to your taste, your lifestyle, doing the best with the ingredients you can source and afford. And to me, the original recipe did not have quite as much flavour as I like. So in addition to using chicken broth instead of water, I also sautéed the leeks in butter (original recipe just simmers the leeks with the potatoes in water) and added garlic. I feel this step really adds to the flavour of the soup because it sweetens the leeks. Oh, and I added croutons. Because I couldn’t resist. But just in case you want to be uber-authentic or you happen to have gotten your hands on the world’s most flavourful potatoes, I’ve included the changes I made in the notes in the recipe below. 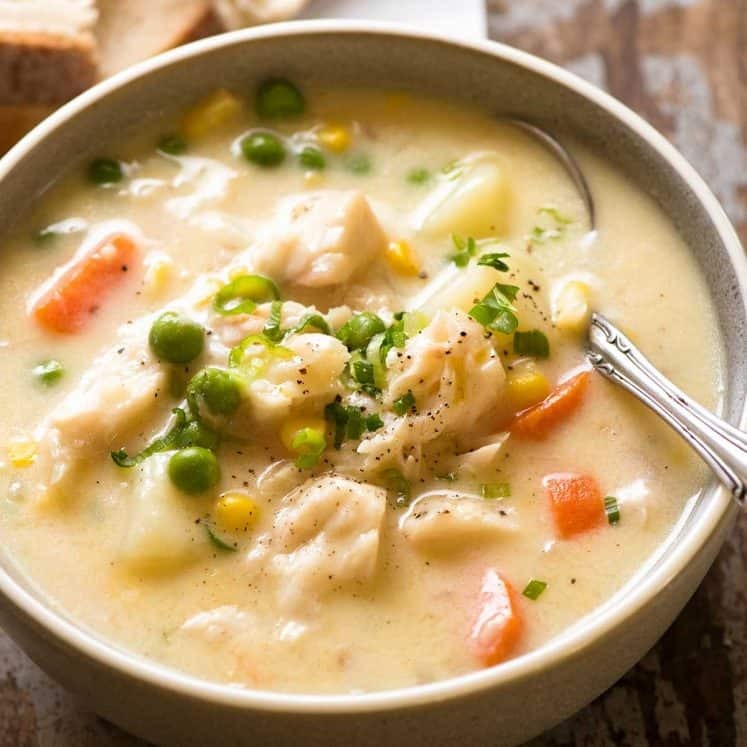 This creamy, classic French soup is super simple to make. Adapted from a recipe by the great Julia Child from her iconic cookbook "Mastering the Art of French Cooking, Volume 1". Refer to the notes for differences to the original recipe. Melt butter in a pot over medium heat. Add garlic and leek and sauté for 7 minutes until soft and sweet. Add potatoes and broth, place the lid on and simmer for 25 minutes or until potato is very soft and almost falling apart. Turn the stove off and puree with a stick blender until JUST smooth. Do not over puree (Note 3). Season to taste with salt and pepper, then stir through cream. 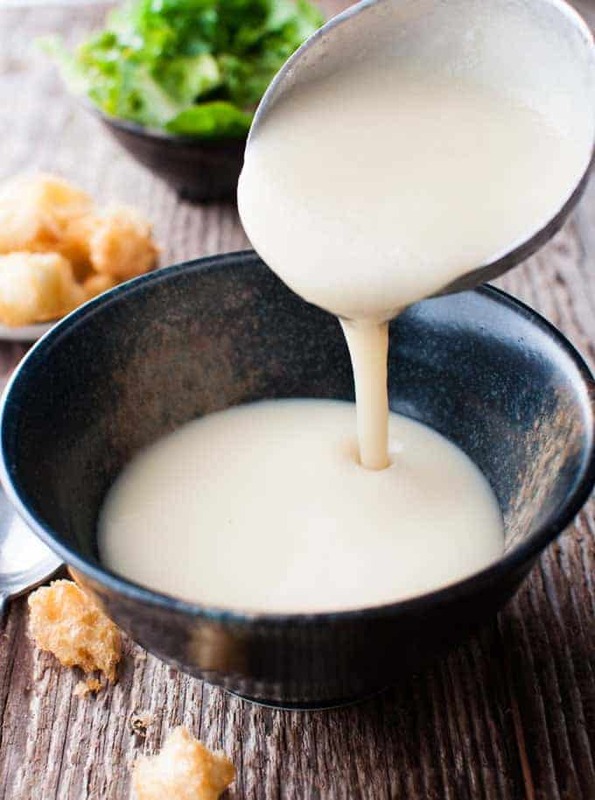 Use water or milk to thin the soup if it is too thick for your taste. Serve, drizzled with cream, sprinkled with chives and with croutons on the side. Preheat oven to 180C/350F. Spray or drizzle bread with olive oil (or melted butter). Bake for 5 minutes or until golden and crunchy. Season with salt. 1a. You can substitute with onions if you prefer. 1b. Potato types suitable: US - Yukon Gold, Russset Australia - Dirt brushed or the common washed potatoes you can get at any supermarket. Do not use red potatoes or new potatoes i.e. the ones that you use for potato salad because they are low in starch so will not break down as much when boiling to create a creamy soup. 2. I made changes to the original recipe to increase the flavour to my taste. The main difference is that I saute the leeks in butter and add garlic, and I use chicken broth rather than water. I also increased the amount of potatoes slightly to make it a bit thicker. Directions: Simmer potatoes and leeks in water for 40 to 50 minutes until tender. Use a stick blender to puree, then stir through cream, season with salt and pepper and serve. 4. 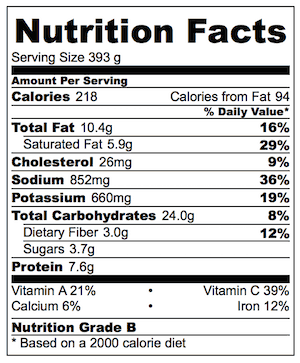 Nutrition per serving assuming 4 servings. Now really. Didn’t Julia know that croutons make everything taste better? This looks so good! 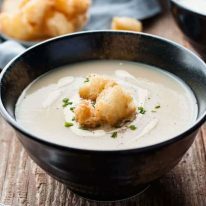 Love a good potato and leek soup, so comforting. Yours sounds delicious and looks so silky smooth, beautiful! 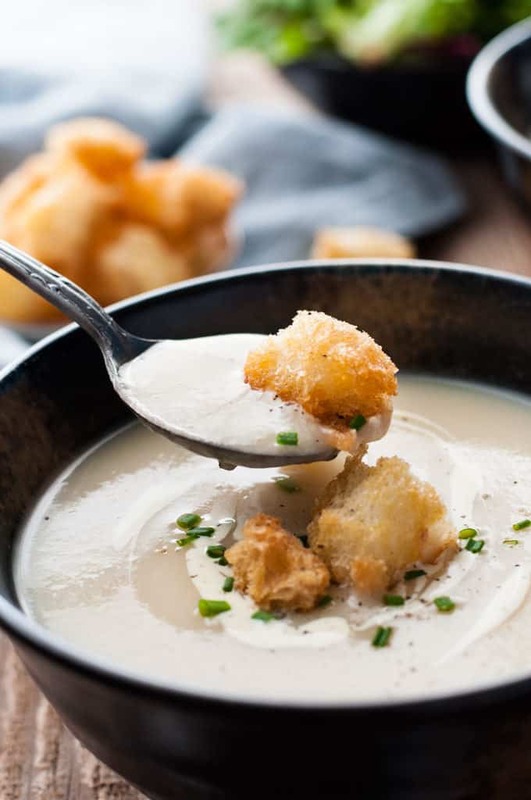 I actually have never had potato and leek soup – but your tweaks sound really good to me. All about bringing out the best flavour of each component, and sautéing the leeks first would certainly achieve that. 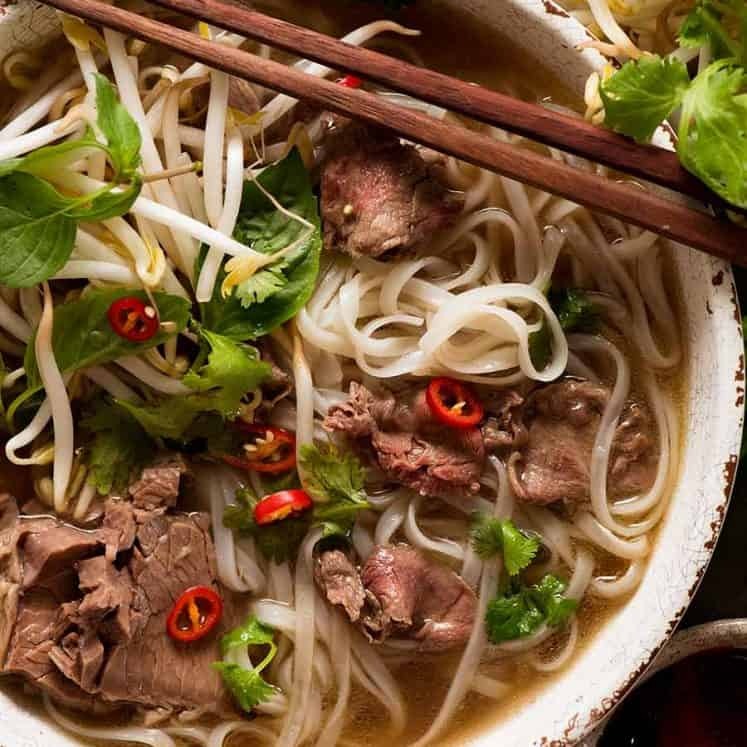 And I really do think peoples palates have changed – I don’t know if part of it is the strong flavours in global cuisine now, like in Asian and Middle-Eastern dishes, but definitely french food can be relatively bland if not done well. At least according to my grandmother, NZ cuisine fifty years ago was the staples of meat + potato + veg every night in most households, and ingredients like fish sauce, avocados and mangos and even things like pasta and rice (if it wasn’t in rice pudding) were just totally unheard of. It has changed so much since then I can hardly imagine what that would be like – but if you were living then, can you even miss something you don’t know exists or have never tried? I don’t know! This was our dinner tonight. My mother made this a lot when I was growinh up, thank you for the reminder! I love this soup. Although I used a bit too much garlic this time it was still good. My grandmother was a private chef in eastern French speaking Canada and moved to the states when she was 28. I learned how to cook by watching her and she never ever used a recipe. Not even the back of an envelope, so everything I make that reminds me of my grand-mère comes from trial and error. What does that have to do with anything? LOL I’m getting to the point. She always cooked her potatoes in stock and would cook her leeks on a really low heat for what seemed ages before adding them to the pot. 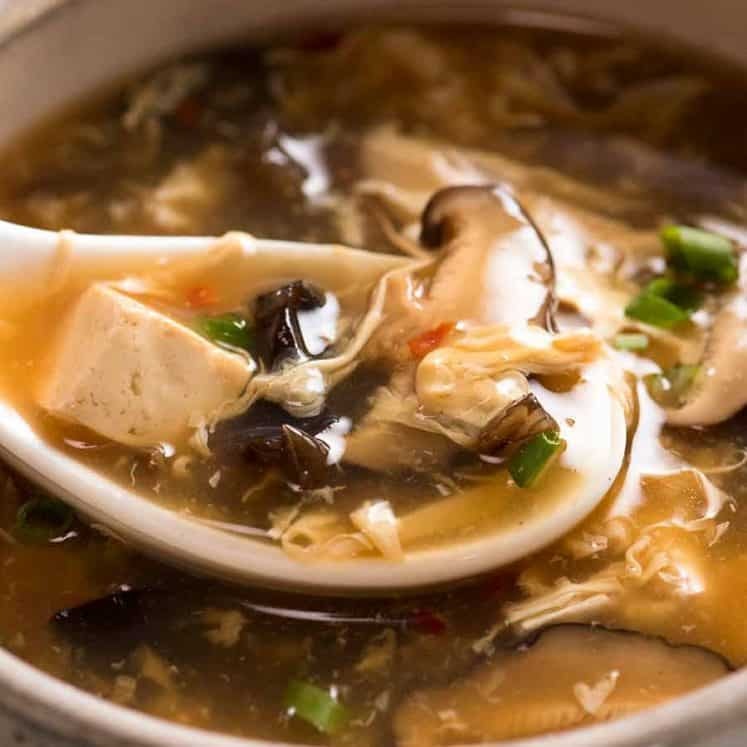 Your soup is like a trip back home. One of my all time favourite soups. I’m definitely making a pot of this and keeping it all to myself! I disagree that people’s tastes have “evolved” or even that French leeks and potatoes are especially flavorful. I often make soups using only water as the liquid, even if the recipe calls for broth or stock. I do not believe that everything must be super rich, concentrated flavors, all the time. We have been conditioned to that in the US, due to prepackaged foods, especially snack foods. I find a clean and sophisticated dish to be quite refreshing, in respect to our modern fast food prepackaged over-flavored foods. My mom used to make this all the time when we were growing up. In fact, she very well may have made it from Julia’s book as a few years ago she gave me her old tattered copy. I’ll have to ask her the next time I talk to her. HI Nagi! This sounds FABULOUS! One question; I live in the US, what type of potatoes would work best? I’d lean toward Yukon Golds, but wonder if a starchier potato, like Russet, would be better in this recipe? Thanks for all your wonderful recipes! Yup, i usually substitute chicken stock for water too. And I also often (but not always) sauté my leeks too. We really are cooking soulmates! So many of our dishes are similar. Haven’t topped mine with croutons, though — love the idea. This is super — thanks so much. Hi Nagi, I’m very glad to see you taking your own twists to a recipe. Julia is the Kitchen Goddess and way ahead of her time but, yes, tastes have changed so much over the decades. I think my own twist will be to rough chop the potatoes/leeks/garlic, toss with oil/salt/pepper, then roast them to get even more flavor! I’ll also not completely puree the soup as I like to have more texture. Your photos are always terrific – makes me want to jump in and eat whatever you’ve made! 🙂 I hope you are having a blast in Mexico and that the food there gives you inspiration for all kinds of new dishes. I love your adaptations. You have added so much depth, flavor to the original recipe. I also love the texture of the soup. I’m gonna go with super powered leeks too 🙂 you did the soup justice love! Really it’s fabulous!!! I love those croutons on there. And you know what, we made this soup in culinary school and my French chef told us to make it on chicken corn stock too and I added in garlic 🙂 so right on the same page! And can I tell you?!? It looks so perfectly creamy! As if you strained it!!! Please forgive me Julia but I agree with Nagi!! We never use plain water when we can use broth and my heavens veggies taste so much better if they are sautéed in butter before continuing to cook. You are ever so right in saying that cooking is adapting to your taste — actually that’s why we named our blog what we did. And croutons??? How could Julia not come up with that. Just goes to show that you are a free spirit whereby Julia, bless her heart, was more mired in the actual French cuisine. Another great recipe with fantastic photos! !